Planning to take a loan for yourself? The capital required to purchase the entire asset would be high. Purchasing an asset out of your savings is impractical. But you still want to go ahead? The easiest way to raise fund is to apply for a loan. Taking loan could be the right option in most of the cases, as it helps you to meet your financial needs. However, if you’ve already spent time trying to avail a loan in your past, then you must be knowing about the entire processes and time taken for it. For every loan borrowed, it includes a series of processes – from applying for the loan to the final release of funds. One must cross several crucial steps in the process of getting their loan approved. All put together, it is commonly referred to as Loan Origination – a process that involves the thorough verification of the borrower’s credentials. Also, this includes the analysis of risk involved during the retrieval of the loan amount (even before the loan gets approved by the lender). 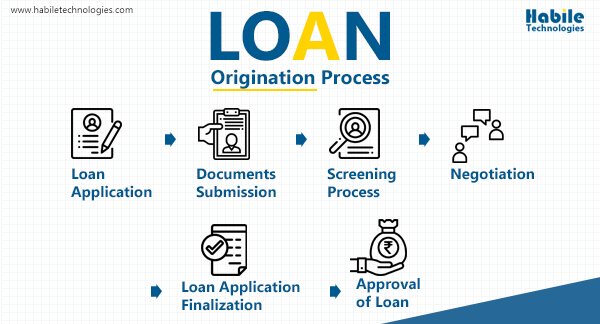 Loan Origination is a critical step and a process through which the borrowers apply for loan, get their documents and credentials verified, undergo the application assessment by the lender, and finally get the loan amount sanctioned. The disbursal of funds includes the amounts paid for goods and services that may currently incur tax, other expenses including cost, money, and overall time. All other processes that are carried out after disbursing the funds until the complete recovery of the loan amount comes under Loan Servicing. Loan originators are the ones who are responsible for managing and maintaining the loan origination process. Generally, loan originators may either work with a financial institution or independently. Independent loan originators can help you get the best deal on a loan, offering you the deal that suits you. Whereas, originators working in a financial institution mostly operate in the best interest of the bank. They prioritise the interest rates the bank offers. Loan Application – The homebuyer or the borrower fills out the loan application form. Documents Submission – The buyer/the borrower must submit relevant documents either during the initial loan application process or after the pre-approval of the loan. Document verification is done to substantiate income, employment, financial status, and other credentials. Screening Process – The lender now screens the buyer’s loan application, verifies the credentials of the buyer, checks their credit score, and determines whether the buyer’s income, as well as the financial status qualify for the loan criteria. Negotiation – Based on the financial status of the borrower and the lender’s approach towards a loan, negotiation could take place depending on favourable loan terms. Approval of Loan – After completing the final processing, the lender makes the final call to approve or reject the borrower’s loan application. With the evolution of technology, digital mediums, and cloud computing technology, even the loan origination process has evolved. Now that the loan origination process has been moved from manual operations to cloud-based technology. This digitalization of the loan origination process is commonly referred to as Digitalized Origination. The Digital Loan Origination process includes all the process that is present in manual loan origination process – namely filling of loan application, collection and validation of supporting data, and other processes. This digital process includes the entire gamut of the loan origination process and keeps the paperwork minimal. Paperless Loan Origination – Thanks to the evolution of the Internet and advancements in the latest technologies. Now, several loan originators have started moving towards a paperless loan origination process. This is because traditional loan origination involves a lot of paper-based work and documents handling. The use of SaaS has helped organizations to move towards Paperless Loan Origination Systems. Managing Documents – The loan origination process involves a lot of document handling. The advent of Cloud-based solutions and several other new technologies have made the document handling process simpler. The borrower’s details and other relevant documents are kept safely and processed in a secure manner. Cloud servers are used to store the KYC details and other relevant documents. Usage of cloud-based solutions eliminates the need for manual maintenance of documents. Also, the verification process is made simple and done with the help of image processing and machine learning process. You can also authorize the documents digitally by choosing the remote “eSigning” option. SMS Facility – Another key advantage of using a digital system is that all your KYC accounts are linked to the mobile number. This means you will be receiving all the transaction details, financial updates, career opportunities, and other banking information via SMS. The lender can check the credit-worthiness of the borrower/customer by analyzing their SMS history. Social Media Activity – The digital world has transformed the lives of people, and thereby everyone has started using the Internet and smartphones. This is another advantage for the lenders as they can analyze the activities of the borrowers. People share and update their day-to-day activities on their social media platforms. This helps lenders to analyze the spending patterns of the borrowers/customers. Psychometric Test – This test is carried out to generate the socio-psychological profile of the customers/borrowers. These psychometric tests help lenders to assess and analyze the borrowers and the risk posed by them (if they can pay back the loan or not). This test result is coupled along with the CIBIL score of the borrower and is used to assess the risk associated. The domestic NBFC organizations and MFIs that serve customers are facing quite a set of challenges. Addressing these issues in manual loan origination process is quite challenging. Traditional loan origination process involves a lot of paperwork and involves manual screening process. This process is cumbersome for both the lenders as well as the borrowers. This poses a major challenge in loan origination process making it time consuming. The manual loan origination process usually takes 35-40 days for the processing (from application filing to sanctioning or rejecting the loan). Also, the credential verification process is quite hectic and takes a long time. Also, there are chances for fool-proofing and malpractice. It goes unsaid that manual processing is generally prone to errors. Hence arises the need for an alternative method that reduces the errors and time-taken for loan-origination. The use of digital technologies and software solutions eliminate the challenges faced in the loan origination process. One such software is Finabile – a Loan Management and origination System software that makes the process simpler. The key challenges involved in manual processing, including documents, handling & maintenance, time constraint, and errors can be eliminated with the help of the Finabile software. It is a robust and scalable Loan management and origination software that is designed with an aim to simplify the entire loan origination process. The Finabile software features a suite of options that delivers operational efficiencies, eliminates the occurrence of an error, makes reporting and analytics integration process simpler, and much more. 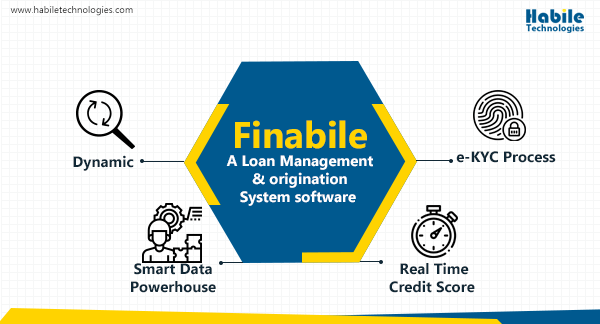 Management of Different Loan Types – The Finabile software helps organizations to work with all kinds of loan products. This software features all kinds of loan products, thereby making the process simpler. Handling of User Details and Documents – With the Finabile software, you can easily update your customer details and store all other documents. This eliminates the need for paperwork and consumes less time. e-KYC Process – The Finabile software features an inbuilt e-KYC solution with it. This feature simplifies the entire onboarding process and the completion of user verification is done in a few minutes. Also, it streamlines the e-KYC processing and reduces the overall time taken for completing the process. Credit Score Details – The loan origination process is based on the credit score of the customers. The Finabile software features a built-in credit-scoring system that assesses the credit score of the borrower. Also, it streamlines and monitors the credit performance for an applicant. Management of Lending Rates – Loan Management and Origination System involves the management of lending rates for each kind of loans followed by origination based on the applicant’s credibility. The Finabile software automatically applies the period-specific base lending rates to each loan applicant. With the advent of latest technologies, the processing time and the processing fee are lowered considerably. To sum up, the use of software products such as Finabile reduces the overall time required for processing.